Glad it's not just me that struggles with a Toblerone. Spice Girls' reunion cancelled after evidence that Geri has really let herself go. Bloody Easter Eggs, 90% packaging, 10% chocolate. I don't think much of Tesco's cheese. It's the monkey bar kid! Tell ya what, Gromit lad, he can keep the cheese. The diet is recommended by the Laughing Cow. Almost the exact reason I stopped dating redheads. "Yum, my favourite. Plastic cheese." There's something cheesy about this photo. "Why does this taste so much like Sally?!" Has to be eaten caerphilly. No whey is he going to swallow that. That can be corrected with braces. Orangutan grating behaviour and Saanenkaese. "Cheese? It's a sucking tub." Jojo makes hay with an unexpected lunch. Donald Trump shows why he wants to make America grate again. 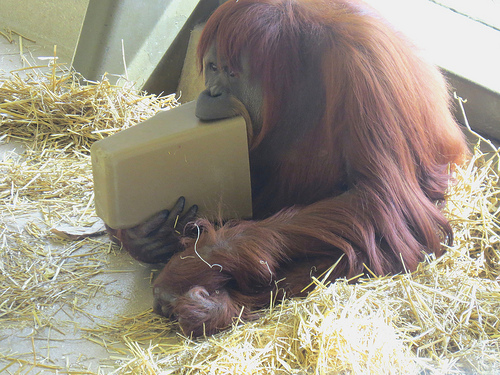 "This cheese doesn't 'alf Pongo"
A little-known fact about orangutans is that they make excellent cheese-graters. "Help! It goes Every Which Way but Loose."